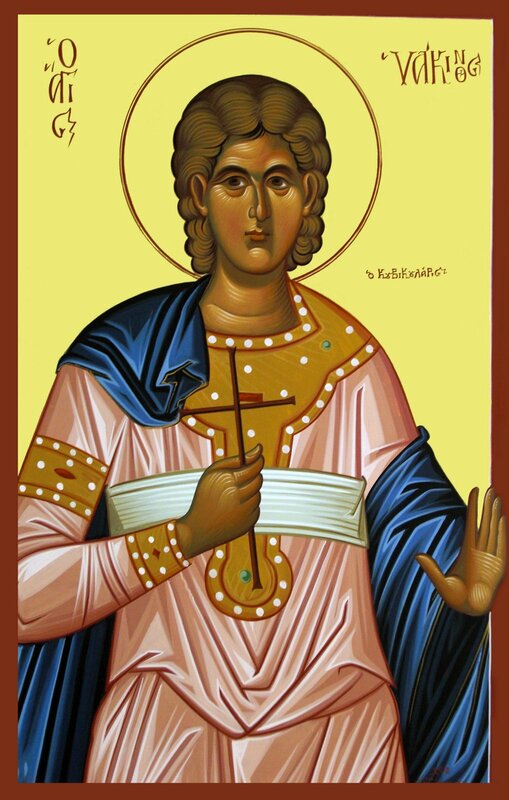 The Holy Martyr Hyacinth, a native of Caesarea Cappadocia, grew up in a Christian family. The Roman emperor Trajan made him his “cubicularius” (bed-chamberlain). Once during the time of a pagan festival the emperor Trajan was feasting in a pagan-temple together with his companions, eating of the idol-offered food, but the youth Hyacinth, having remained at the palace, shut himself up in a small room and prayed fervently to the Lord Jesus Christ. One of the servants overheard the words of prayer. He made a denunciation to the emperor, that Hyacinth, entrusted with an imperial position, did not honour the Roman gods but was secretly praying to Christ. They immediately arrested Saint Hyacinth and led him to Trajan. The emperor demanded that he eat of the idol-offered meat, but the saint bravely refused and declared himself a Christian. By order of Trajan, they locked up the holy martyr in prison after fierce tortures, and they exhausted him with hunger and thirst, so as to force him to eat of idolatrous food. On the 38th day, one of the guards, bringing the idol-offering meat, saw Angels alongside the martyr, dressing him in bright attire and placing on his head a crown. The torturers decided to continue with the trial over the saint, but they found him in prison already dead. The twelve year old Hyacinth died in the year 108 in the city of Rome. They afterwards transferred the relics of the saint to Caesarea. His body is preserved and venerated in the abbey church of the former Cistercian Abbey of Fürstenfeld in Bavaria, of which the church is the only surviving structure.